Create a new database on the same SQL Database server recovered to a specified point in time within the retention period. Create a database on the same SQL Database server recovered to the deletion time for a deleted database. Create a new database on any SQL Database server in the same region recovered to the point of the most recent backups. Create a new database on any SQL Database server in any other region recovered to the point of the most recent replicated backups. If you configured backup long-term retention you can also create a new database from any LTR backup on any SQL Database server in any region. You cannot overwrite an existing database during restore. Restore of P11–P15 to S4-S12 or P1–P6 if the database max size is greater than 500 GB. Restore of P1–P6 to S4-S12 if the database max size is greater than 250 GB. The extra cost is because the max size of the restored database is greater than the amount of storage included for the compute size, and any extra storage provisioned above the included amount is charged extra. For pricing details of extra storage, see the SQL Database pricing page. If the actual amount of space used is less than the amount of storage included, then this extra cost can be avoided by reducing the database max size to the included amount. For a very large and/or active database, the restore may take several hours. If there is prolonged outage in a region, it is possible that there are large numbers of geo-restore requests being processed by other regions. When there are many requests, the recovery time may increase for databases in that region. Most database restores complete in less than 12 hours. There is no built-in functionality to do bulk restore. The Azure SQL Database: Full Server Recovery script is an example of one way of accomplishing this task. To recover using automated backups, you must be a member of the SQL Server Contributor role in the subscription or be the subscription owner - see RBAC: Built-in roles. You can recover using the Azure portal, PowerShell, or the REST API. You cannot use Transact-SQL. 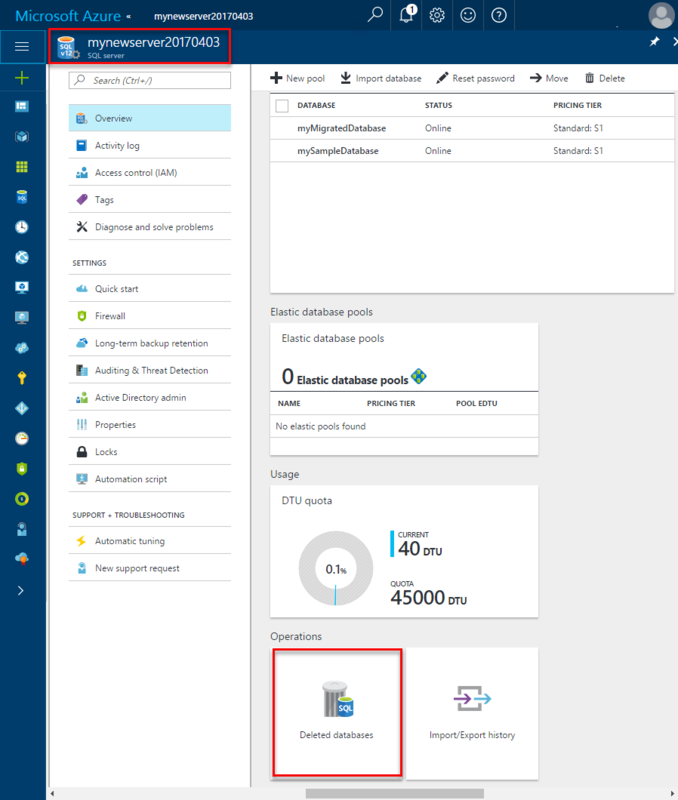 You can restore a standalone, pooled, or instance database to an earlier point in time as a new database on the same server using the Azure portal, PowerShell, or the REST API. A database can be restored to any service tier or compute size. Ensure you have sufficient resources on the server to which you are restoring the database. Once complete, the restored database is a normal, fully accessible, online database. The restored database is charged at normal rates based on its service tier and compute size. You do not incur charges until the database restore is complete. You generally restore a database to an earlier point for recovery purposes. When doing so, you can treat the restored database as a replacement for the original database or use it to retrieve data from and then update the original database. If the restored database is intended as a replacement for the original database, you should verify the compute size and/or service tier are appropriate and scale the database if necessary. You can rename the original database and then give the restored database the original name using the ALTER DATABASE command in T-SQL. If you plan to retrieve data from the restored database to recover from a user or application error, you need to write and execute the necessary data recovery scripts to extract data from the restored database to the original database. Although the restore operation may take a long time to complete, the restoring database is visible in the database list throughout the restore process. If you delete the database during the restore, the restore operation is canceled and you are not charged for the database that did not complete the restore. To recover a single, pooled, or instance database to a point in time using the Azure portal, open the page for your database and click Restore on the toolbar. You can restore a deleted database to the deletion time for a deleted database on the same SQL Database server using the Azure portal, PowerShell, or the REST (createMode=Restore). You can restore deleted database on Managed Instance using PowerShell. You can restore a deleted database to an earlier point in time during the retention using PowerShell. For a sample PowerShell script showing how to restore a deleted database, see Restore a SQL database using PowerShell. If you delete an Azure SQL Database server instance, all its databases are also deleted and cannot be recovered. There is currently no support for restoring a deleted server. To recover a deleted database using the Azure portal during its DTU-based model retention period or vCore-based model retention period using the Azure portal, open the page for your server and in the Operations area, click Deleted databases. You can restore a SQL database on any server in any Azure region from the most recent geo-replicated backups. Geo-restore uses a geo-redundant backup as its source and can be used to recover a database even if the database or datacenter is inaccessible due to an outage. Geo-restore is the default recovery option when your database is unavailable because of an incident in the region where the database is hosted. If a large-scale incident in a region results in unavailability of your database application, you can restore a database from the geo-replicated backups to a server in any other region. There is a delay between when a backup is taken and when it is geo-replicated to an Azure blob in a different region. This delay can be up to an hour, so, if a disaster occurs, there can be up to one hour data loss. The following illustration shows restore of the database from the last available backup in another region. For a sample PowerShell script showing how to perform a geo-restore, see Restore a SQL database using PowerShell. Point-in-time restore on a geo-secondary is not currently supported. Point-in-time restore can be done only on a primary database. For detailed information about using geo-restore to recover from an outage, see Recover from an outage. Recovery from backups is the most basic of the disaster recovery solutions available in SQL Database with the longest Recovery Point Objective (RPO) and Estimate Recovery Time (ERT). For solutions using small size databases (e.g. Basic service tier or small size tenant databases in elastic pools), geo-restore is frequently a reasonable DR solution with an ERT of up to 12 hours (generally much less). For solutions using large databases and require shorter recovery times, you should consider using Active geo-replication or Auto-failover groups. Active geo-replication offers a much lower RPO and ERT as it only requires you initiate a failover to a continuously replicated secondary. Auto-failover groups enable automatic failover for a group of databases. For more information on business continuity choices, see Overview of business continuity. 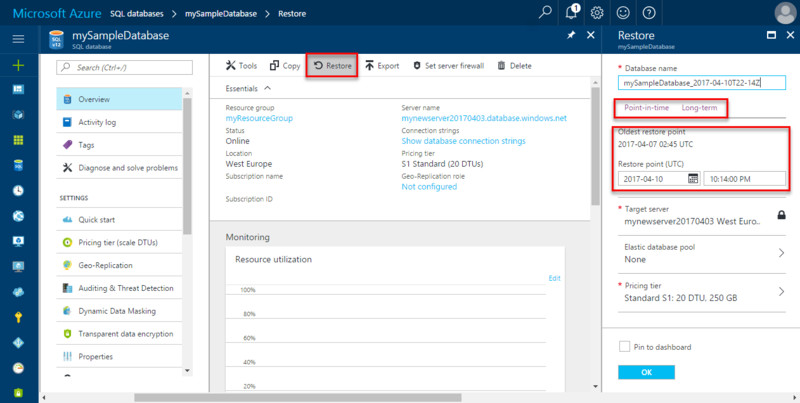 To geo-restore a database during its DTU-based model retention period or vCore-based model retention period using the Azure portal, open the SQL Databases page and then click Add. In the Select source text box, select Backup. Specify the backup from which to perform the recovery in the region and on the server of your choice. Geo-restore using the Azure portal is not available in Managed Instance. Please use PowerShell instead. As previously discussed, in addition to the Azure portal, database recovery can be performed programmatically using Azure PowerShell or the REST API. The following tables describe the set of commands available. To restore a standalone or pooled database, see Restore-AzSqlDatabase. Get-AzSqlDatabase Gets one or more databases. Get-AzSqlDeletedDatabaseBackup Gets a deleted database that you can restore. Get-AzSqlDatabaseGeoBackup Gets a geo-redundant backup of a database. Restore-AzSqlDatabase Restores a SQL database. For a sample PowerShell script showing how to perform a point-in-time restore of a database, see Restore a SQL database using PowerShell. To restore a Managed Instance database, see Restore-AzSqlInstanceDatabase. Get-AzSqlInstance Gets one or more managed instances. Get-AzSqlInstanceDatabase Gets an instance databases. Restore-AzSqlInstanceDatabase Restores an instance database. To restore a single or pooled database using Azure CLI, see az sql db restore. Automatic backups protect your databases from user and application errors, accidental database deletion, and prolonged outages. This built-in capability is available for all service tiers and compute sizes. For a business continuity overview and scenarios, see Business continuity overview. To learn about long-term retention, see Long-term retention. To learn about faster recovery options, see Active geo-replication or Auto-failover groups.